The twitchy little beast taunts. It rains rodent curses down upon my hapless canines. Scampering up a tree trunk, leaping across limbs, it disappears beyond the fence toward an unknown lair deep in the neighbor’s yard. The chittering foreign laughter, the scent of chaseable mammal, and that irritating banner of a tail are a siren call too powerful to resist. The dogs must follow it, no matter how doomed they are to failure. The squirrel teases. 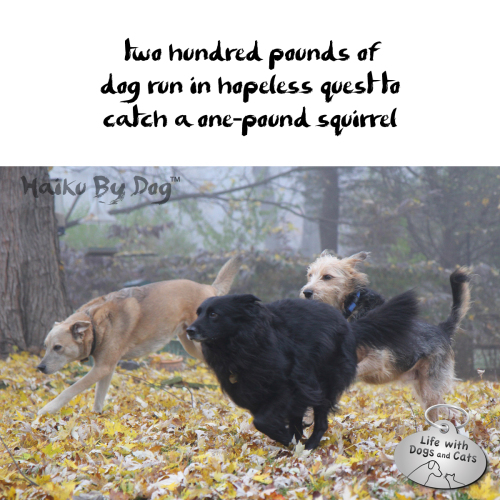 The dogs give chase. BlogPaws Nose-to-Nose Award Nomination Deadline is January 31! Have I made you nod, think, smile, or laugh this past year? Nominations for the BlogPaws Nose-to-Nose Awards are open–and anyone can nominate any blog in several categories, such as Best Overall Blog, Best Photo, Best Blog Post and Best Humor Blog. If you enjoy my work–and that of other bloggers–you can nominate your favorite post or blog here. If you can’t remember specific Life with Dogs and Cats posts you like, you can read a recap of some of my posts, find a complete list in my archive, or you can look at my stories, photos, humor — and of course Haiku by Cat and Haiku by Dog! Thank you all so much for being fantastic, engaged and supportive fans! 17 Comments on "Haiku by Dog: Quest"
Thank you. I don’t think my dogs would know what to do if they caught one either! Squirrels are truly the superior creatures of earth. The nemesis of my dogs — and cats! de tree afturr de squirrel.. So true. If the cats and dogs could work together…maybe they’d get those varmints! I bet those squirrels are little teases, too. Fun to watch, though! Oh those cheeky squirrels! They like to tease us too. Lucky for them, we’re on the inside and can’t do much about it. If it weren’t for those windows…ah those squirrels are just plain lucky! Very cool! 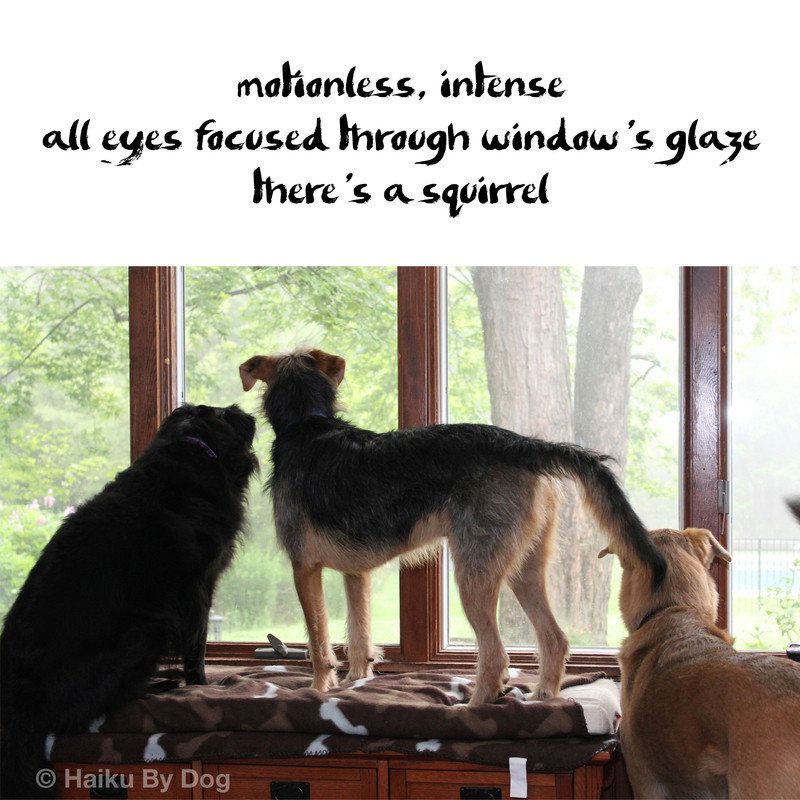 The squirrels tease us all the time in the window. Squirrels will do that. Cheeky little creatures! It looks like your pack is having a lot of fun! I hope they enjoyed their chase 🙂 My kitties enjoy watching squirrels on Cat TV.